I read Kotaku’s write-up on Anthem’s E3 showcase, and while it absolutely looks gorgeous, there is a lot that concerns me. Anthem’s developer, BioWare, is best known for RPGs like the Knights of the Old Republic (KotOR) and Mass Effect series. In these games, there was a gargantuan amount of focus on three areas: plot, allowing the player to affect the universe around them through their actions, and the relationships between the player and NPCs. 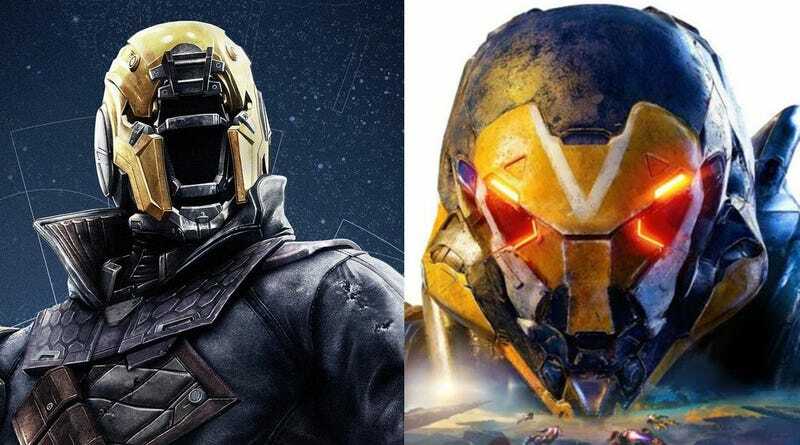 Anthem seems to be straying from this tried and true combination and electing to use an obtuse plot involving some looming, nefarious threat, and paying attention mainly to multiplayer elements, which is more in Destiny’s wheelhouse. At the moment, there won’t be any PvP at launch, but they left the door open to that later down the road. This isn’t necessarily a bad thing, as they can be exhilarating, but I’m worried that they will be more concerned with “perfecting” that aspect of the game while failing to deliver a good story. That’s what usually happens with games like this. Destiny is an awesome multiplayer oriented franchise, but it has a troubled history with its campaign storyline. Bungie, Destiny’s creators, have way more experience with making multiplayer games than BioWare, which only had the somewhat tacked-on multiplayer mode in Mass Effect 3. Creating a game that is almost entirely centered on an element of gameplay that you don’t have a lot of experience crafting should make a lot of costumers wary. If the scenarios they are devising for the game are being setup with “teamwork in mind”, it means that if you choose to go solo, you’re going to have a diminished experience. BioWare has built up a fanbase that loves rich stories and enjoys exploring worlds on their own terms, and by focusing so much on a co-operative play, they risking losing their main costumers. The story so far seems derivative and annoyingly vague, more so than Destiny. At least Destiny had the benefit of tapping into not only Bungie’s multiplayer experience, but also a nerdy flair (thanks to the revamping of the Vanguard, Cayde-6 in particular). For the moment, Anthem seems to be eschewing what BioWare does well and instead trying to market itself to a different, more action-oriented audience. This is not a bad thing necessarily, but it remains to be seen if they can pull it off. That being said, I’m a sucker for this kind of stuff, and I’ll probably buy it anyway. It may take a week or two after they release it and have several sources review first, but I may suit up and dive in. What are your thoughts on Anthem at the moment?